The houses architects build for themselves often reveal much about their makers—just think of Thomas Jefferson’s Monticello, Frank Lloyd Wright’s Taliesin, or Sir John Soane’s 13 Lincoln’s Inn Fields. The homes of architectural auteurs are testaments to their philosophies, their religions, their gods. 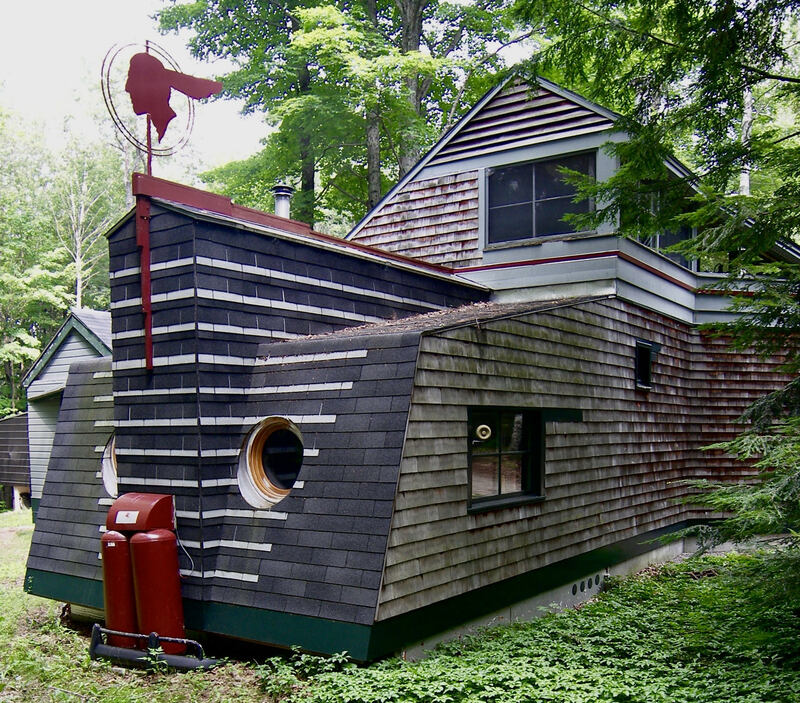 And Daniel V. Scully’s compound in the shadow of Mount Monadnock near Dublin, New Hampshire, is a fascinating, if little known, example of a self-referential project that consumed half of its designer’s life. A slab of Vermont slate—the tombstone of the architectural historian, Vincent Scully—lies in wait on the ground for a sketch of the temple of Juno at Agrigento to be carved into it. Vincent Scully—Dan’s father—glimpsed the Greek ruin from a warship during World War II, a sighting that marked the beginning of his love affair with architecture. Another relic of the classical world on Dan’s compound is his sheet metal interpretation of the Winged Victory of Samothrace. Living and working in the shadow of a famous parent can be intimidating, but Dan Scully gamely embraced the world of architecture. He worked for Louis Kahn during the summers of his college years, and at the Yale School of Architecture, Scully was a member of Charles Moore’s socially responsible Yale Building Project class of 1970. He also joined Robert Venturi and Denise Scott Brown’s groundbreaking Las Vegas seminar, and, from then on, pop culture—particularly cars—crucially informed his design aesthetic. Scully finally settled in the mill town of Harrisville, New Hampshire, designing homes, schools, and commercial buildings throughout the Monadnock region. Scully is also something of a motor head; automobiles are integral to his vision of America as “a fast and restless place carved out of wilderness.” In 1980, he bought eight acres of land in the neighboring town of Dublin and began to create his own world of “carchitecture.” It should come as no surprise that Scully’s impact on the property was informed by his dynamic, “road runs through it” raison d’être. Today, Scully’s multistructure tableau is recognized as a notable addition to Dublin’s remarkably rich collection of American architecture. Scully’s whimsically serious work is more idiosyncratic than frivolous. His temple to the Gods of Speed faces the house down an alley lined by silver gazing balls. The heart of this didactic folly is a solid-fuel dragster, the engine of which has been replaced by a woodstove. As in 18th-century picturesque landscapes, the compound’s buildings are about memory and evoking associative emotions in viewers. This neoclassical trope continues with the garage, where Scully prepares vintage Volvos for races. Giant piston-columns composed of silver-painted, 55-gallon drums flank the main entrance, and license plates serve as frieze decoration between the metopes of the full entablature. The plates are arranged from east to west, beginning with New Hampshire and ending with California, echoing the vector of American expansion. Atop the garage—where in classical Greece, a statue of Athena may have stood as the venerated icon—is a Mobil gas pump. There are a variety of smaller outbuildings and objects that catch the eye: a 1950 Ford pickup originally bought for 50 dollars 50 years ago, a chicken-coop homage to the Quonset hut, a rusted-out truck with a snow plow attachment. 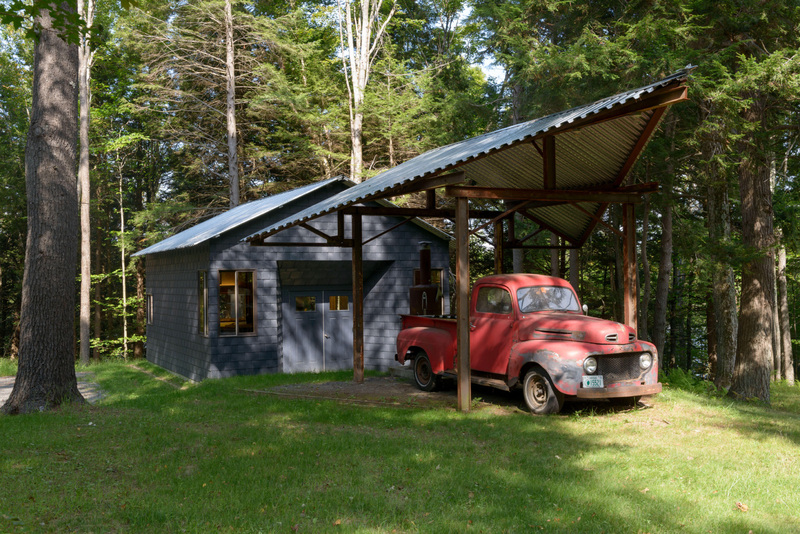 A 1957 Cooper Formula 3 racing car hovers over file cabinets in Scully’s latest and perhaps final structure on the compound, the Archives Studio, a 20-by-24-foot shed wrapped in plastic roofing tiles that have been manufactured to resemble slate. Inside the shed, a 1968 Dan Scully painting of a Maserati engine faces Giambattista Nolli’s 1748 map of Rome. A 20-foot-long drafting table sits beneath a strip window that, Aalto-like, frames a view of the lake and neighboring forest. This seemingly humble cube, although reminiscent of Le Corbusier’s Cabanon de Vacances in size and function, is a nod to the Enlightenment—more Jean-Jacques Rousseau than Henry David Thoreau. The primitive hut can surely be thought of as man’s earliest temple, but Scully’s Archives Studio also defers to the Yankee aesthetic of utility and thrift. 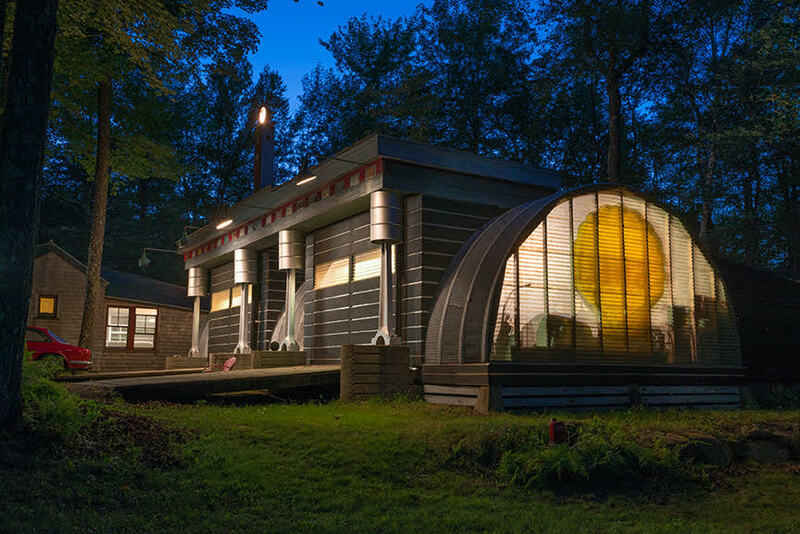 After decades of work echoing the movement of cars and trains, this idyllic shack is just the place for a restless genius to contemplate his contributions to the manmade environment.